Tim Dawson and Wren Brier are partners, both in game development and in life, and their game Unpacking is very much the natural result of their combined worlds. Dawson began working in the Australian gaming industry in 2004 on console games before going independent in 2013. Brier, meanwhile, comes from the world of mobile free-to-play games. These combined skill sets, along with a few others at independent studio Witch Beam, have resulted in Unpacking, a casual PC game that doesn't quite fit in either of those two worlds. Brier said the idea for the game's primary conceit came from their combined experience, too. "When Tim moved in with me and we were unpacking his things, we saw that this was actually kind of gamey," she says. "You unpack an entire box, and that feels like an achievement, and when you finish unpacking a box and put it away, you unlock the next box under it, and you're collecting sets. So you're getting things from different boxes, and suddenly you have a full set of figurines, or plates, or bowls. There's a sense of accomplishment in it." That's exactly what Unpacking is. It's a game where you unpack boxes of things and organize them in various household environments. Written out, it seems fairly mundane, but looking at the gifs of the game that Witch Beam has used for marketing, it's easier to see the appeal. "We have a lot of people that look at [Unpacking] and go, 'Oh, I don't want to do that. I've moved like five times recently, that doesn't sound like my idea of a good time'," Dawson says. "But the main thing is that anything that's simplified and distilled is generally more fun than the real thing. When you empty a box, it folds up and disappears into a little puff of particles. Objects can be moved around freely and it doesn't hurt to rearrange the microwave 15 times. It's a very flowing experience." "Anything that's simplified and distilled is generally more fun than the real thing"
Brier adds: "It's like how I could be, in the past, unemployed, but playing The Sims and my sim is the president and their house is super organized and their life is so good, while my life is not that great. In a game, it's a lot easier and requires a lot less effort to achieve much greater things. "In Unpacking, you can unpack an entire kitchen in ten minutes and get to do all the fun things of organizing a kitchen, deciding where things go and being surprised by the items that come out of the box, and exploring the new kitchen you've arrived in, as opposed to doing heavy lifting and taking the boxes down to rubbish bins and that sort of thing." Relaxing games about everyday activities certainly aren't unheard of, but outside a few sim genres, they're often relegated to mobile. But both Brier and Dawson think there is something inherently valuable in physically sitting down at a PC to play a game like Unpacking. Brier specifically mentioned the importance of relaxing games as a counter to what seems to be a growing level of stress in everyday life. And for Dawson, he finds the genre comfortable not just to play, but also to make. "My last game was very skill-focused," he says. "It had competitive leaderboards and was very driven around moment-to-moment gameplay that you could fail very easily. I was very comfortable working in that space, but for some reason Unpacking also feels really comfortable. There's something nice about the flow state. You can concentrate on what you're doing and feel like you're making progress. That's a type of gaming that's beneficial to people." At first, it might seem that developing a game about a mundane, common activity would be simple due to the sheer number of simple reference points for how it might work. But both Brier and Dawson says Unpacking had presented an unexpected challenge: nearly everyone who tested it had a very strong opinion on how the game's mechanics should work. "When you're working with more fantastic or imaginative ideas, you get a lot more slack to do what you want," Dawson says. "But everyone has a very firm idea about how a kitchen or domestic environment works. Anything that feels wrong really rubs them the wrong way. Not being able to put things in a drawer the way they want annoys them more than the way an alien gun works, because alien guns are imaginary but drawers are not." Brier continues: "We found that people have very strong feelings about how to unpack things and how a house should be laid out. If we don't let them do things they would do in their home with their things, it creates a lot of friction and takes people out of the zen experience we're trying to create. "Our game has a part in it where toward the end, once you've unpacked all the boxes, the game lets you know that certain objects aren't in the right place - on the floor, or just not properly put away. When we first implemented this, it was a lot stricter than what we have now. We just said, 'This is where we put things in the kitchen, so these other places are not okay.' That immediately made people very angry. The first playthrough where we implemented that feature was very frustrating for players. They'd be like, 'I leave this thing in the sink. I leave my pots on the stovetop. This is where I put it.' If this is the feedback we get about the placement of an item, it's usually legitimate and it means we need to revise our ideas of what's allowed." Dawson says: "I think the domestic setting has been a real double-edged sword. People are drawn into it because they relate to it, but they're also very picky about things." "Not being able to put things in a drawer the way [players] want annoys them more than the way an alien gun works"
Fortunately, there's a balance there. That pickiness from players has also inadvertently led to some entertaining gameplay, as Brier and Dawson noticed when they brought Unpacking to Double Fine's Day of the Devs event last week. "People were super receptive and supportive," Brier says. "We were next to some very beautiful games and having people notice us was very heartening, and I think probably the best thing is that we were given pretty large screens for each game, so people in the line were watching people play Unpacking and were making little judgments about how the person at the front was playing and how they were placing items around the kitchen. It was very entertaining, and they made it a group activity. I think whenever we show it next we'll try our best to have a large screen sitting fairly high up." Unpacking is still very early in development. Dawson and Brier are about three months into a project that Brier says she anticipates (but doesn't promise, of course) will take about year and a half. Yet the game has already gotten a lot of audience buzz on social media and elsewhere due to a bit of accidental marketing stemming from the Stugan game accelerator program. Stugan is a non-profit accelerator program for game development that takes place over a two-month period in Stockholm, Sweden. The 2018 program, of which Unpacking was a part, had over 400 game prototypes submitted and 15 selected. Brier says she never expected to get in, but that them being there at all is a testament to the importance of independent developers trying for every opportunity possible. "Give everything your best shot as long as you've got the bandwidth to actually do the thing," she says. "We applied for Stugan and I didn't think we'd get in, and we got it. It's not that we don't think our game is good enough. We think it's great. But there are so many great games out there. You might think, 'I won't try for this one,' or 'Not yet,' but this game has gotten all these opportunities so early and I think it's because we've been trying since very early on. We've applied to things we haven't gotten into as well. Don't be put off by rejections, but also take feedback into account. Course correct whenever you need to, but just trying is very important." "Give everything your best shot as long as you've got the bandwidth to actually do the thing"
Dawson adds: "That was a really validating first step. We had this idea, we wanted to make it, and we thought it was good, but to have Stugan accept it meant it had legs. 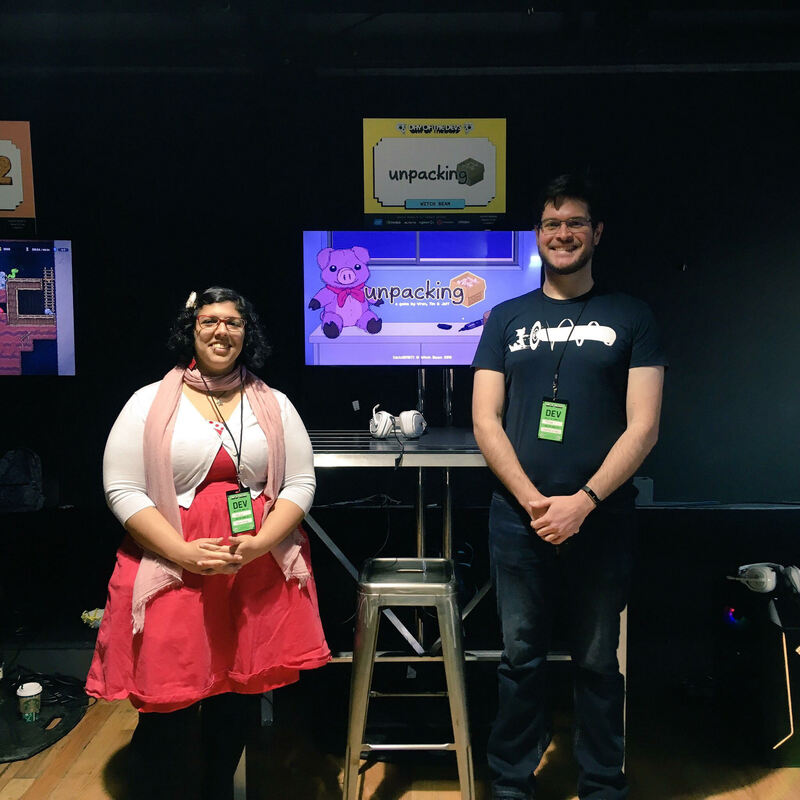 And while we were over there, the whole experience was amazing and the other developers were really supportive and cool and we bounced ideas off of each other." Both Brier and Dawson mentioned multiple times how helpful it was to have so many other developers and supporters playtesting Unpacking while working in Stockholm. It helped them refine the project ahead of the program's concluding presentation, and the attention to detail was what garnered them their first bit of mainstream buzz - a retweet of a gif of their game from Vlambeer's Rami Ismail. Dawson and Brier told me that the retweet spurred an enormous and unexpected amount of traction for their game that went non-stop for about 48 hours, bringing the game's Twitter account from zero to 6,000 followers. Though the sudden burst of interest was a pleasant surprise, the two are understandably nervous about maintaining momentum. "We're kind of worried if this is going to be a fad where people forget about us," Dawson says. Brier adds: "And it's scary how the Internet remembers everything you say. I'm always afraid to say something, like, early on I mentioned what platforms we were hoping to put it on and then someone was parroting that like gospel. But we're still figuring this out." Still, a non-stop line for the entirety of the event at Day of the Devs last weekend was heartening, especially since Dawson and Brier intend to lay low through the end of the year and focus on development. "I hope we can have a fairly open development and show people what we're working on," Dawson says. "I always get excited about what we make, and I hope we can let people in as much as we can."